Facebook has listened to users’ demands to crackdown all the unrelated content/ pages on the online social media platform which blatantly “beg” for people’s engagement in bizarre and insipid posts. The world’s largest social network has decided to take unrelenting action against those pages and groups owners that shamelessly beg the users to ‘like’, ‘comment’, ‘tag’ or ‘share’ their posts in order to see “magical” results or win “pricey” gifts. The users’ engagement increases the visibility and rank of these pages/ groups on Facebook search and they get ads from multiple companies in return. You must have seen such statuses like “Share with friends to win a free smartphone” or “Like if you agree.” These sort of posts capture people’s attention and their engagement in the post ultimately helps the post, and eventually the page owner, to boost their rank in the search results. Basically, by reacting on the post, it shows up on newsfeeds of people’s friends too. 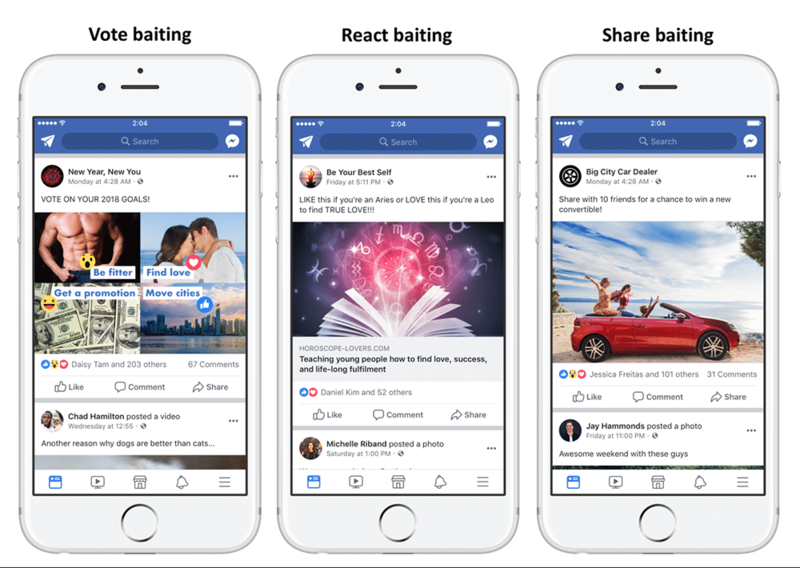 A new update to the newsfeed algorithm will do stricter monitoring of individuals/ pages that are using “clickbait” tactics to trick the users who log in to their Facebook accounts to enjoy and relax for a while. The new update will force the “engagement baiters” to use original and legitimate means to engage the traffic to their pages/ content. Eventually, the social media platform, with more than 2 billion monthly active users, hopes to be a less scruffy place for everyone. The idea is for pages and individuals to cut down on forced clickbait content. According to the company, their smart newsfeed algorithm will detect any ‘offending’ engaging content that features “hundreds of thousands of posts” fed to the system to detect any clickbait spam posts. However, Facebook still has to answer some tougher questions in this regard that will overall impact the user experience with this new update.